In the savvy film, “New York Stories,” the character played by Nick Nolte is an artistic genius, drunk and painting ferociously all night long to ear splitting rock music in his very romantic loft studio. Artists’ studios are remarkably diverse. A setting for contemplative reflection or for wild collaborative social galas, hidden in a barn or located in a “state of the art” warehouse..cluttered or pristine.. all, even in Nick Nolte’s fictitious studio, are places where creative work happens! 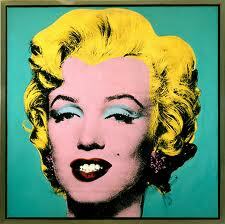 Check out these famous artists’ (and one not so famous!) studios. 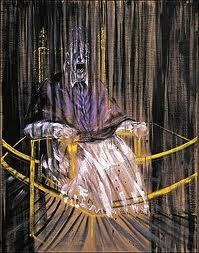 "Portrait of Pope Innocent X"
You may love or hate his work but Francis Bacon, Irish artist, is famously known for his paintings of bold graphic and emotional raw energy. Margaret Thatcher described him as “that man who paints those dreadful pictures.” The Tate Museum in London sold out two Francis Bacon retrospective shows. View this unbelievable video of Bacon’s Studio. 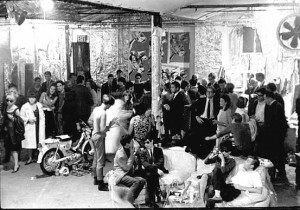 Andy Warhol’s studio was not only his working space but the hip hangout for musicians, artists, film stars and socialites. 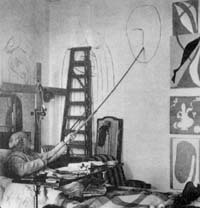 His studio was called The Factory. 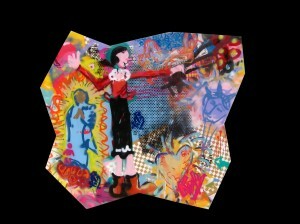 Kirby Kendrick, San Diego/Santa Fe, NM, artist paints on any surface that stands still long enough. You know them by who they hang out with or it is, you know them by their studio decor/frivolity? I vote for “… I paint on anything that stands still.” My studio could be a barn, a boat, a bar, a side walk cafe, an available attractive woman. The artistic result seemingly is independent of location. My favorite is where ever I happen to be, equipped with a sketch pad and piece of charcoal. Kirby, this is awesome! You are giving me so much to not only satisfy my curiosity, but also to arouse my curiosity to learn more about art history. Thanks for all the photos and videos. What fun! 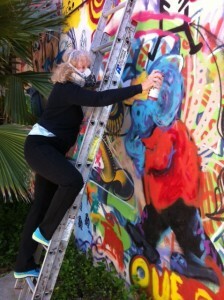 I love the photo of you on the ladder – risking your life for art. ;) You are a good example to us all. I loved seeing the video of your show. What a fun and uplifting show. 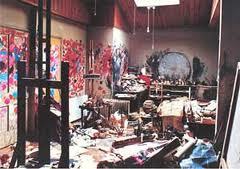 The studio of Francis Bacon is interesting, cause like the audio said, “It represents his personality”. OH MY !!!! If my studio represents my personality, I am in trouble. Kirby, I have so many thoughts and feelings as I look over the various artists’ studios along with their work that I can’t make my mind take hold of THE comment I would like to make. I got all caught up in how our environment is so connected to our individual inner worlds. I kept thinking Bacon should have gone to Clutterers Anonymous! Sorry, I often can’t get out of my therapist hat. I don’t want to look at his work, except for a few seconds. He must have been in such turmoil. 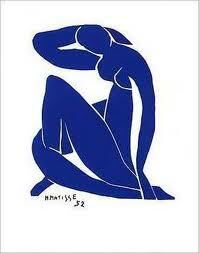 But I would have loved to pay Matisse a visit in his final studio. I might have even had the nerve to try is wall painting method and to watch him do that.